Donald L. Weisinger was born February 14, 1931 in Houston County to Fletcher Smith Weisinger (b. September 26, 1887 in Houston County) and Jewel Fay Tisdale (b. March 15, 1908 in Freestone County parents were James Smith Weisinger [b. May 1, 1866], and Isador Campbell Weisinger [b. July 29, 1868 in Houston County]). Jewel’s parents were William (Bill) Henry Tisdale (b. March 21, 1881 in Freestone County) and Laura Evans Tisdale (b. July 1, 1888 in Freestone County). Donald Weisinger married Lucille Koepnick on July 26, 1950. Lucille’s parents are Alfred 0. Koepnick (b. June 4, 1890 of Rochester, New York) and Ruth Heath Koepnick (b. January 31, 1911). Donald and Lucille have 5 children: Donnie Ray (b. February 28, 1952), Shirley Ann (b. July 28, 1954), Barbara Lynn (b. October 30, 1957), Donald Gene (b. January 5, 1956) and Billy (b. November 16, 1960). Donnie Ray married Lanita Cutler on February 19, 1972 in Grapeland, Texas. They have 2 children: Eric Alexander (b. April 6, 1982) and Kurt Wilhelm (b. August 4, 1985). They live in Lafayette; La. Shirley Ann married Rajah Huff on January 29, 1983 in Grapeland, Texas. They have 1 daughter: Kristina lysha (b. August 4, 1985). They live in Grapeland, Texas. Donald Gene married Gwendyl Steadman on July 11, 1975 in Grapeland,Texas. They have 2 children: Jason Don (b. October 20, 1978) and Jeremy Wayne (b. May 7, 1980). 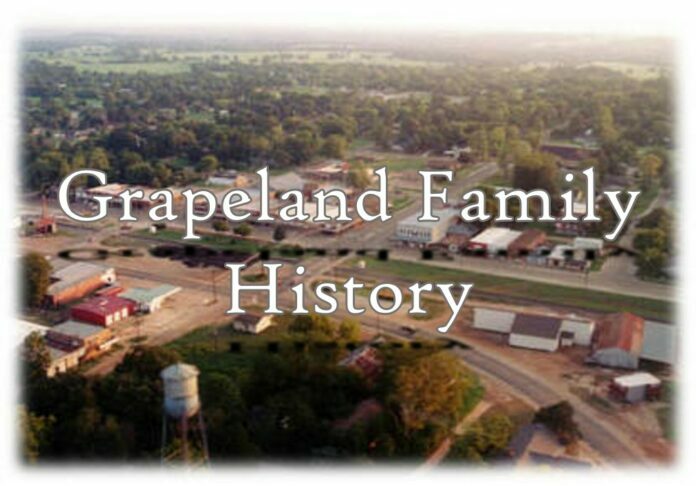 They live in Grapeland; Texas Barbara Lynn married Gregory Arland Brown on June 5, 1975 in Grapeland, Texas. They have 2 children: Lindsey Nicole (b. October 9, 1983) and Garrett Arland (b. November 5, 1986). They live in Grapeland, Texas. Billy Weisinger married Sherry Lynn Camp on July 5, 1980 in Grapeland, Texas. They live in Grapeland, Texas.